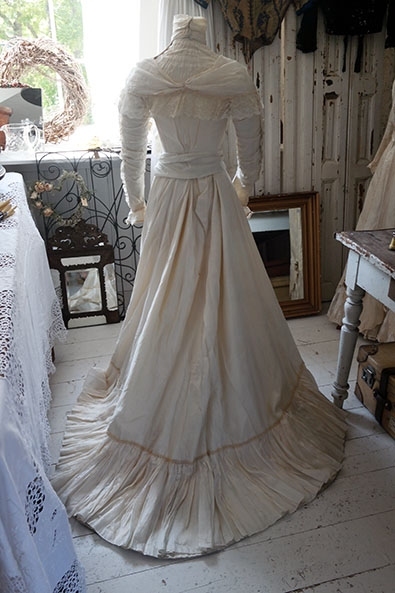 Beautiful antique Victorian silk wedding gown in creamy white, with train, ca. 1890. A gorgeous and very romantic gown! Made of very fine creamy white silk with small very light peach coloured details, beautiful shades! 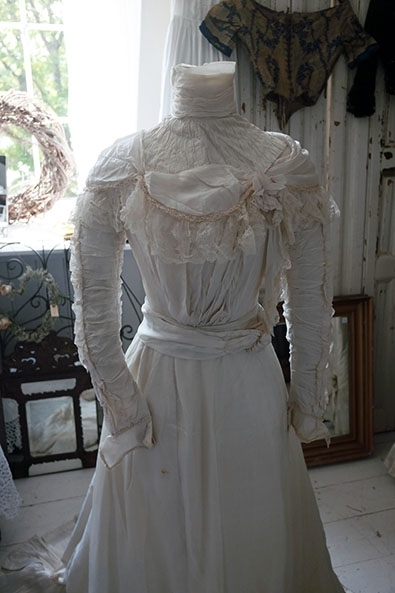 The gown has a very pretty bodice, it has a draped silk decoration around the shoulders, chest and back, trimmed with a very large ruffle of fine lace, decorated with a silk rose and silk and lace streamers. 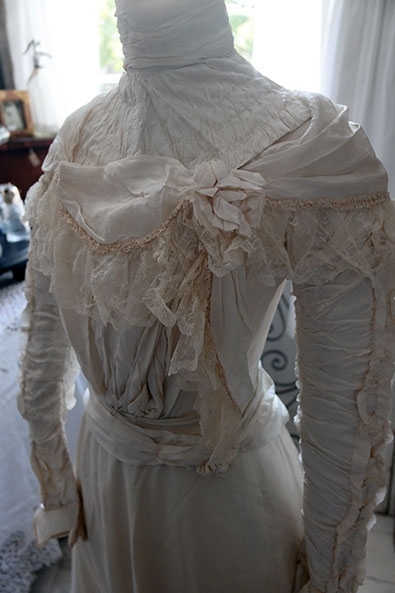 The top part of the bodice is ruched and has a very high neck, the front is pleated, but does not yet have the later wider pigeon breast shape, the bodice is form fitting. 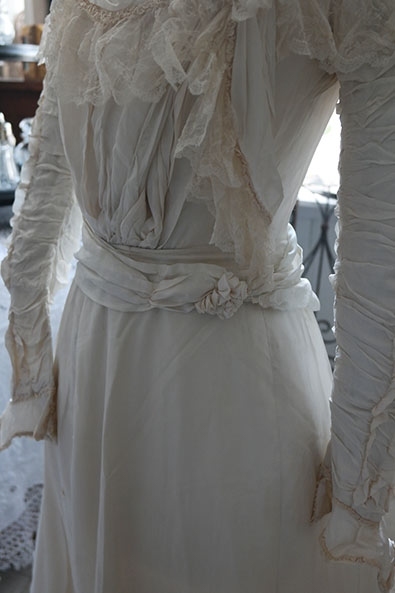 The sleeves have pleats and fine ruching. The bodice is fully lined and boned. 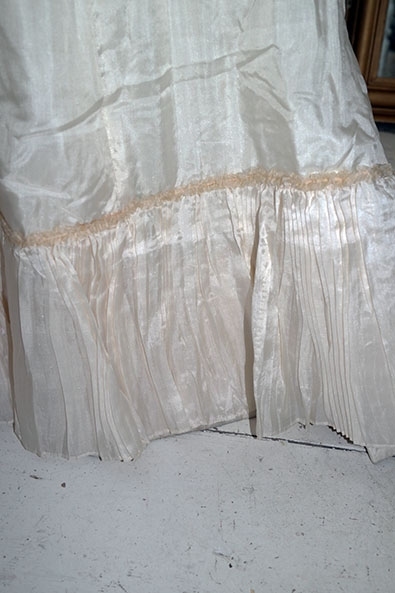 The skirt is very full and has a very large diameter, the bottom is trimmed with a large silk ruffle and the skirt has a good sized train. 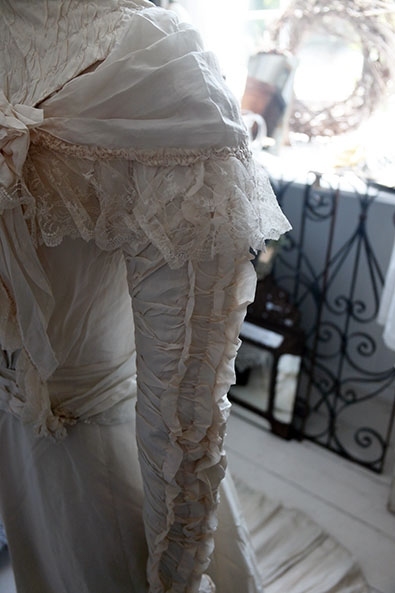 The skirt is also fully lined with linen, making the skirt stand out on it's own without an underskirt pretty well. 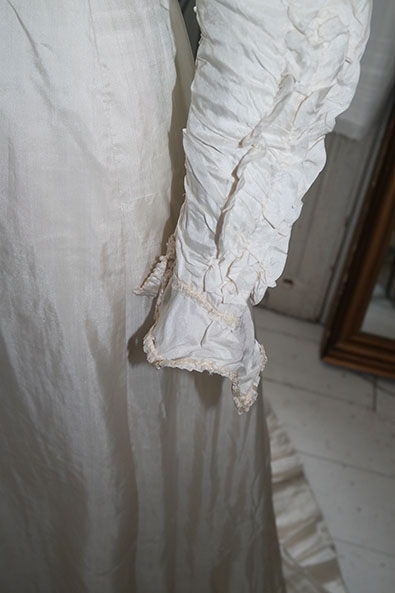 The gown is in very good condition, the silk, though very fine, is in very good shape, no tears or worn spots, not brittle. 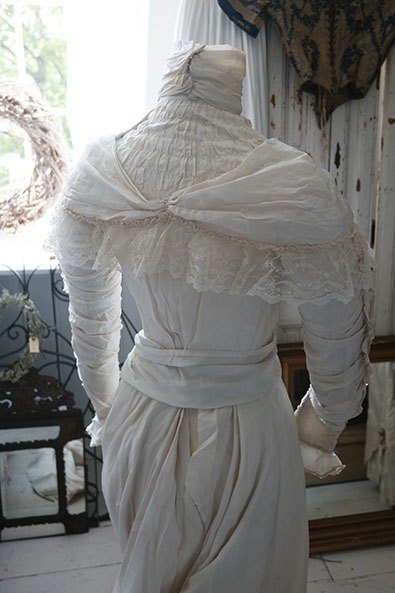 There is damage to the lace ruffle on the bodice, there are tears in the lace, but these do not stand out at all because of the design, and the lace is securely attaced. The gown is a very small size, it measures 57 cms at the waist and only 74 cms at the chest. 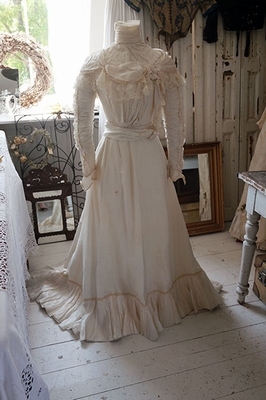 The (new) mannequin on which it is displayed in the pictures can be bought with the gown if you wish. It has been made to size for the gown. Price €50,-.